The Hindus in India do celebrate Ganesh Chathurthi each year during the month of September(falls on different dates according to Hindu calendar), with a lot of tradition, devotion, and hope that the Lord will bring them success all through the year and removes all obstacles that stand in their way. People are ecstatic when it comes to celebrating their day with the elephant-headed Lord than any other festival and you will find people dancing in joy on the streets in many parts of India. While there are stories from different angles on why Lord Ganesha got an elephant head, there are a lot of values one can learn just from his pure, elegant elephant face. There is a nice, truistic, subtle way, one can teach kids and themselves with this festival and its celebration. 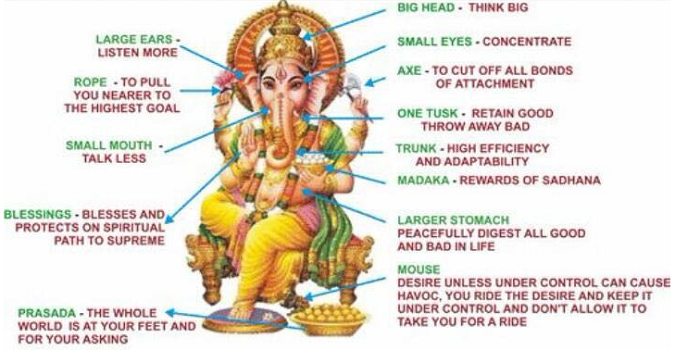 Just like each and every single Indian festival has a lot of core values it teaches mankind, celebrating Ganesh Chaturthi or Vinayaka Chavithi has got it’s own share. In this article, an effort is made toward such enlightenment, that might help adults remind themselves and help their kids understand in a way that their little minds can comprehend better. ‘in’- ‘tuition’(intuition- waking up the tutor in yourself), there is absolutely no result of worshipping God even if it is done in the most traditional, culturally perfect way. Chant the mantras, but with the whole heart and waking up your inner self. Let’s see what the obstacle remover has to offer in terms of teaching his followers. Small eyes- Looking something very far we tend to close our eyes partly, making them small. Which symbolically represents that we have to look far and deep before making any decisions in life. Big ears- Be a great listener. Big Stomach- Hide and hold your biggest, deepest sorrow and pain inside your stomach. Modak- Five fingers together. Be in unity always. Elephant’s trunk- be both strong and soft. The trunk can lift heavy objects, yet malleable and flexible. Lotus flower- always in the mud. Yet so beautiful, pure and detached from the mud. Life should be lived in the same manner. There is going to be negative stuff all around us, yet we have to be detached and rise above that. Mouse- To keep our negative emotions in control. The mouse is the only animal that numbs the area before it bites so the person cannot feel the pain. When vices start taking control of a person, it would not occur that they are doing something wrong, it feels so cool and numb. So, a mouse used as a vehicle for Ganesha meant to represent and teach to take control of all your negativity at all times. If a person is able to do all of the above, it means, he is able to write his own destiny and become victorious in life. That is why Ganesha is an obstacle remover. And, finally, we make an earthen eco-friendly Ganesh idol that is disproportionate and immerse in the water. Just like a man that is ever born gets dissolved in the soil and that he always belonged there. All religious scriptures have been translated and interpreted by the human brain in a number of different ways. The original essence of any divine scripture remains the same. Just practicing rituals will do no good, and unfortunately, that has become the first priority for many people. Now, in the name of God, we have done many things that are illogical, insensible, and have already spoilt the environment by using all sorts of chemicals in making Ganesh idols and immersing them in the pure rivers. Let’s come out of that vicious cycle of convictions and also teach our future generations what’s best for their future and worship only the eco-friendly idols and connect with the divine with the pure soul.